Brooklyn’s Atlantic/Pacific – featuring Garrett Klahn (Texas is the Reason) and John Herguth (House & Parish) – sign with Arctic Rodeo Recordings and announce the release of their debut album “Meet Your New Love” – due out October 29th, 2010. These two experienced rockers are joined by Ian Love (Rival Schools) who contributes guest instrumentation as well production skills to help the group create their psych/folk sound that will appeal to fans of indie-rock as well as rock and roll traditionalists with its’ looped yet tribal yet shuffling drums and both dynamic and big guitar sounds. “Meet Your New Love” was recorded and produced by Ian at the Brooklyn Love Studios this past winter and features 10 songs of give and take intimate vocals – Garrett’s immediate, John’s hushed, a study of layered guitar work and pensive melodies ranging in influence from Fleet Foxes, Beach House, Washed Out and The Smiths. In addition, the album was mastered at the Boiler Room in Chicago by Collin Jordan, whose skills can be seen on albums from Kanye West to Ministry. Atlantic/Pacific formed in the summer of 2008 when long time friends Garrett Klahn and John Herguth began kicking around a few songs in Garrett’s Brooklyn apartment. Soon after, Atlantic/ Pacific started performing in NY and Europe with projections of 70s skateboarders and surfers playing behind them. The band did shows with Mercury Rev, Neil Halstead, Chamberlain, and Walter Schreifels, and have played the UK’s TRUCK Festival – an annual UK music festival often seen as a microcosm of Glastonbury, Reading and Leeds – for the last two years in a row. 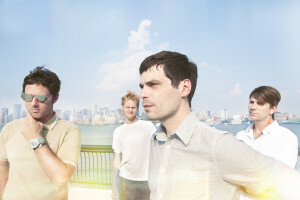 In the fall of 2009 they self-released an EP called Autumn Edition Volume 1 – which was well received by fans and led them to start work on their full-length debut. Atlantic/Pacific was thrilled when Arctic Rodeo Recordings approached them about joining their majorly diverse roster and releasing Meet Your New Love.